John von Bergen is a US born artist who has been based in Berlin for the last eight years. 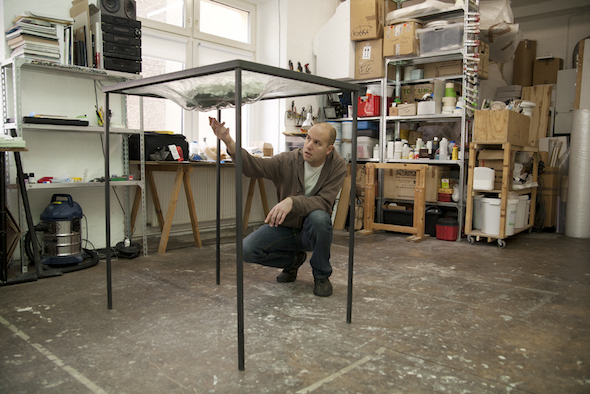 His studio, a large space in Wedding, is a true working space – John works primarily with sculpture and installation, and his material experiments, works-in-progress, and many completed works are installed around the walls. One of the first things I noticed in John’s studio was a white installation high-up on one of the walls, installed in such a way that it was virtually impossible to tell where the wall ended and the sculpture began. Protruding out, the work appears as a fantastical extension of the wall reaching out into the room. For his show at the project space Smack Mellon last year, John took this strategy to an extreme – creating a 45 foot (15 meter) large-scale, site-specific work that appeared to emerge from the walls of the gallery itself. The piece, Whip Lash, appeared to involve a large metallic pillar (cast from an actual pillar in the gallery) being supported mid-air by two huge wall ‘protrusions.’ The usually neutral and austere white wall of the space was transformed into an almost antagonistic force – one defying physics, logic and reality. As you can probably tell, it’s hard to describe John’s work without giving elements of his sculptures some agency, imagining they are capable of movement and deliberate action. In The Anti-Precious Moment yet another wall embellishment appears to have stretched out and crashed through a glass cabinet, merging with the red velvet within. These pieces feel like a special effect frozen in time, a freeze-frame from some science-fiction horror film, perhaps “Attack of the Modern Gallery.” While artists have long used gallery walls as a material concern in their works, John takes this to an extreme, violent and sometimes comical reimagining of the capability of a space. John’s drawings actually have a similar organic feel to his sculptures. Using fine pencil rendering, his drawings are based on photographs of inanimate objects. The resultant images are abstractions that seem to allude to the natural world. To me, they are reminiscent of bones or muscle tissue, plant fibers, or porous driftwood. They continue to reveal John’s interest in transformation; the drawings make the artificial appear natural, as his sculptures make the inanimate seem alive. For many sculptural works John creates surfaces that appear to have rusted away. Rust, in the natural-world, is a slow transformative process. By mimicking this effect (using a special rust imitation paint), John not only alludes to the idea of transformation but also to the fact that “faking something” is itself transformative. The pillar in Whip Lash is a mere forgery, but by appearing to defy gravity (as it references the far heavier original pillars next to it), it transforms the rules of the space and suspends our disbelief. Last year, while completing a two-month stay at The Fountainhead Residency in Miami, John took the idea of artifice and illusion to dangerous new levels. 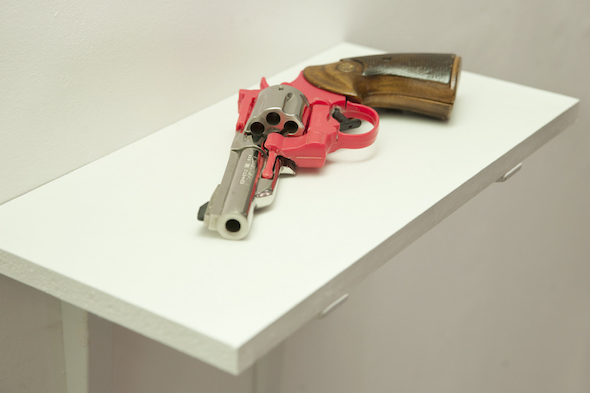 Intrigued (and no doubt slightly disturbed) by the prevalence and availability of guns in Miami, John proceeded to make a gun sculpture using both real gun parts and parts from a plastic pink water gun. Difficulties arose when John realized that in order to transport the piece from Miami to his home in Berlin, he would have to bring the components of a real firearm through airport securities and into a foreign land. Could a non-functioning weapon still be considered a weapon? Did the appearance of danger equate to actual danger? Would security personnel in USA, the UK and Germany all accept “it’s just art” as a valid explanation? I won’t ruin the whole story, which is eloquently told by John on Artslant: www.artslant.com but suffice it to say that John and his gun were both safe and sound in Berlin when I saw them last.